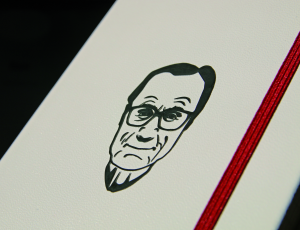 The advertising media agency Hageman designed a notebook for the merchandising collection of the Bucerius Law School in Hamburg that is decorated with the portrait of Gerd Bucerius. Among other things Bucerius was the initiator of the Zeit foundation, which founded the law school. His bust adorns the campus in a stylish form this was to be represented as the trademark of the planned merchandising collection. A task, which in cooperation with MinT Products Hagemann literally mastered in an outstanding way: The characteristic bust of Bucerius was initially illustrated in the modern “Fritz-Kola” style and subsequently transferred onto the notebook as a “silicon cutting”. The wafer-thin, extremely filigree silicon layer additionally lends the book its modern appearance and an interesting haptic feel and is fixed to the cover. An all-round successful implementation that the jury of the Promotional Gift Award 2017 honoured with a prize in the category Customising Technologies.